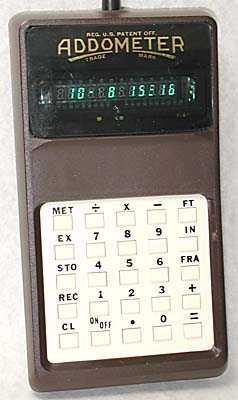 Non-decimal electronic calculators were highly unusual in the days when displays only had 8-digits. Addometer, operating in Feet and Inches mode, displaying 10 feet, 8 and 15/16 inches. Distinctive features: Feet and inches calculator. Display is green vacuum fluorescent. Has Feet & Inches and Metric modes, and memory. Metric mode has the standard 4-functions, and memory, while Feet & Inches mode does not have multiplication and division, only addition and subtraction. Integrated circuit - Rockwell A7872-11 (here date coded 1980). 84 x 154 x 42 mm. (3.3" x 6.1" x 1.7"). Addometer Company, Dolton, Illinois, U.S.A. The [MET] key changes between Metric and Feet & Inches modes. The [FT] key defines the number just entered as feet, then the [IN] key defines the number just entered as inches, and the [FRA] key the number just entered as a fraction (rounded to the nearest 1/16th). In metric mode the calculator operates with a fixed decimal point giving two places of decimals. 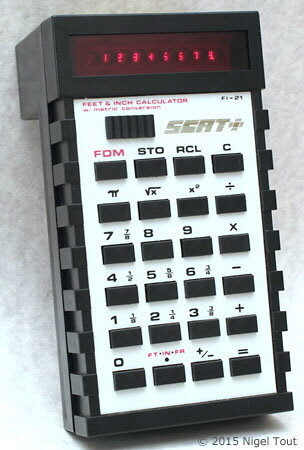 This calculator has a case style similar to that of some Rockwell models (see the Rockwell-Anita 201 and 202/SR) and uses a Rockwell integrated circuit. 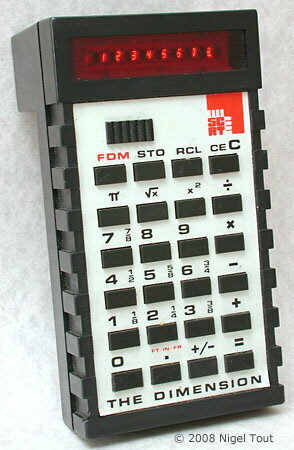 Thus, there appears to be a Rockwell connection in the production of this calculator, however Rockwell had left the calculator market a few years earlier so this connection is unclear. This calculator was kindly donated by an architectural company and can operate on Feet & Inches for architectural calculations. Although the Addometer Company, and other manufacturers, had produced mechanical calculators operating in feet & inches for many years, electronic calculators capable of operating in these non-decimal units were late on the scene. In metric mode displaying 123456.78. In feet & inches mode displaying 999 feet, 11 and 11/16 inches (which is a few 1/16 ths below the maximum it can display). 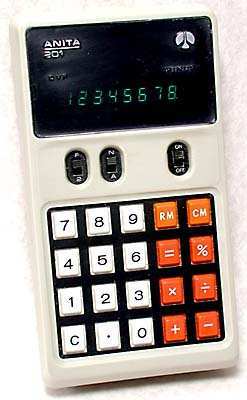 On the rear of the case is a fold down stand, typical of the Rockwell calculators using this case style. 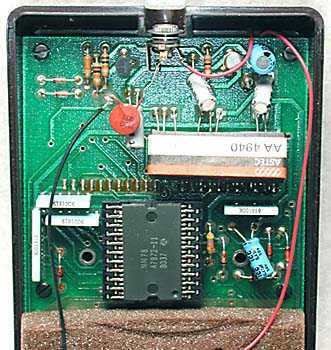 Inside the calculator showing the Rockwell integrated circuit. Two versions with the same functionality. Has Feet & Inches and Decimal modes. Manufactured by South Carolina Applied Technology, U.S.A. 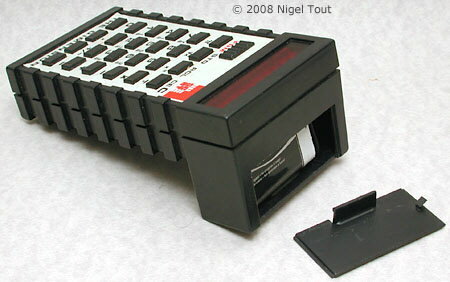 This calculator has a very unusual shape with a bulge at the back for the battery compartment, though this allows the calculator to sit at a good viewing angle on a desk. In feet & inches mode the display makes use of decimal points and a dash. Here it shows 13 feet 7 3/4 inches. Nowadays there are several models of electronic calcuators which operate in feet & inches, and also models which use other non-metric units, such as time (hours, minutes, seconds, and frames, useful for television program technicians).